I have heard talk and talk, but nothing is done. Good words do not last long unless they amount to something. Words do not pay for my dead people. They do not pay for my country, now overrun by white men. Good words will not give my people good health and stop them from dying. Good words will not get my people a home where they can live in peace and take care of themselves. I am tired of talk that comes to nothing. It makes my heart sick when I remember all the good words and broken promises. Right now, it seems more likely that the Chumash people and all those who care about preserving Malibu’s Chumash heritage, are instead facing more potential losses. The logic is that the site has been disturbed before and makes it OK to disturb again, I guess. 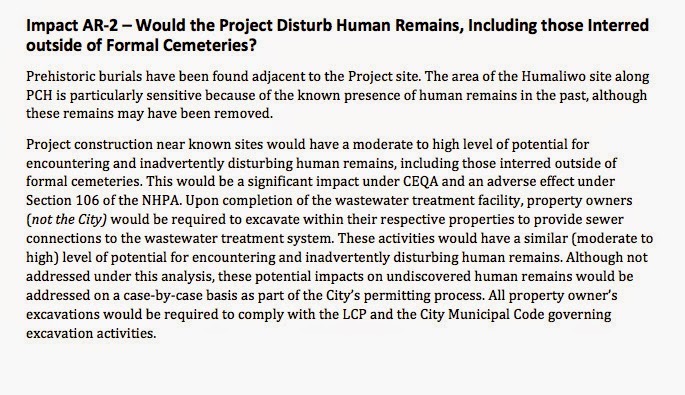 The report states that a monitor will be employed for excavation work in the vicinity of the wastewater treatment facility. Any artifacts or burials that are uncovered and not accidentally pulverized will presumably be reinterred elsewhere, but it’s disheartening. Malibu is built on shattered fragments of the past. This coast was inhabited for an estimated ten thousand years by the Chumash and their ancestors. The descendants of Malibu's original residents are still working to piece together a heritage and cultural identity almost entirely erased first by the California Missions, and then by generations of persecution and discrimination. The potential for the sewer project to disturb what remains of the community's Chumash heritage is troubling, but there’s another important cultural site in the Civic Center area that is at even greater risk of irreparable damage, and that’s the Malibu Rancho Hotel project site on the corner of Malibu Canyon Road and Pacific Coast Highway. This small undeveloped piece of old Malibu is a significant Chumash village site and is also said to be hallowed ground, where human bones may still lay undisturbed in the earth. Bulldozers were at work there this week, clearing the ground, despite the fact that the owner reportedly doesn’t have a permit for excavation work. It wouldn’t be the first time a developer bulldozed an important cultural site accidentally or on purpose.When it’s gone it’s gone and one can build whatever one likes without worrying about the ghosts of the past. It doesn’t matter that it was sacred, or that the bones of someone’s ancestors were laid to rest there. It doesn’t matter that a priceless piece of history is gone forever. Large Chumash and pre-Chumash cemeteries are known to have existed at Arroyo Sequit, Trancas Canyon, Point Dume, Paradise Cove, Solstice Canyon and the Malibu Lagoon area, and archaeologists estimate that there are thousands of smaller grave sites scattered throughout the Santa Monica Mountains. Many of the most significant Chumash sites were allegedly leveled or buried in the 1920s to make way for Pacific Coast Highway, and disturbed again in the 1940s, when the road was widened. Burials from the Leo Carrillo area excavated during the construction of Pacific Coast Highway in the 1920s. 140 burials were identified at this site, but many had been disturbed by earlier grave robbers and the site was salted with numerous fake artifacts—more about that in a future post. In 1915, human remains representing a minimum of two individuals were removed from 'the Malibu Ranch,' an unknown location in Los Angeles County, CA. The human remains were subsequently donated to the Natural History Museum of Los Angeles County by Irving V. Auger. No known individuals were identified. No associated funerary objects are present. At an unknown date, human remains representing a minimum of 13 individuals were removed from Arroyo Sequit Mound in Arroyo Sequit. The human remains were subsequently donated to the Natural History Museum by E.D. Mitchell. One set of human remains was identified by a tag reading 'EDM. 281, burial 18, Arroyo Sequit Mound." The other 12 sets of human remains were identified by a tag reading "California Los Angeles County Arroyo Sequit Shell Mound Misc. Bones EDM-274." At an unknown date, human remains representing a minimum of three individuals were removed from a site in Solstice Canyon. The human remains were subsequently donated to the Natural History Museum of Los Angeles County in 1971 by the Native Daughters of the Golden West. Archaeologists from UCLA, USC, LACC, and the Southwest Museum, dig up bones at an unidentified Malibu location in 1956, while residents watch with interest. The accompanying caption reads: "A bulldozer uncovered ancient Indian skeletons about two feet underground while preparing a site for a real estate development." This photo is from the USC Digital Archive, and was originally taken for the Los Angeles Examiner. The bones excavated at the Trancas Canyon Cemetery site, CA-LAN-197, really did end up in the basement of a university. The area was initially excavated in 1968 by a group of Malibu residents. This wasn’t a scientific investigation as much as it was a sort of entertainment, like the Victorian fashion for acquiring Egyptian mummies and then having a special unwrapping party. 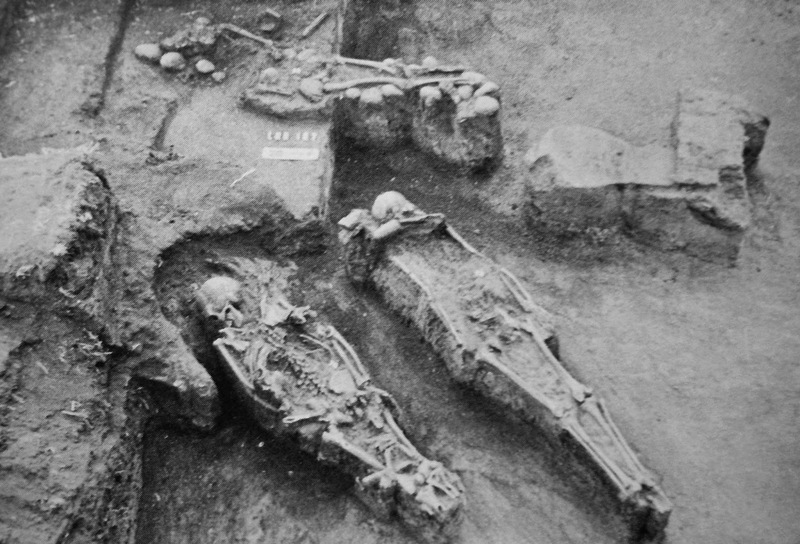 UCLA archaeologists later stepped in to supervise the excavation, but only after other neighbors, alarmed by the cavalier treatment of human remains, called the sheriff to report suspicious activities. 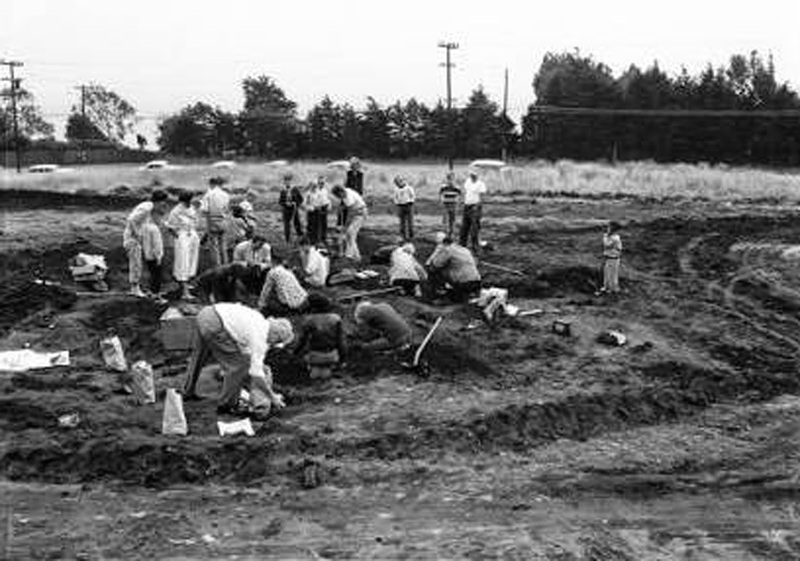 Self-appointed amateur archaeologists began excavating bones at what is today the Trancas shopping center in 1968. It was a sort of anthropological free-for-all. Eventually the sheriff was called and university archaeologists stepped in. Very few grave goods were discovered but the longstanding rumor that the best artifacts ended up as paper weights and in curio cabinets could help account for that. This photo is from the 1968 Chamber of Commerce phone directory. Stotsenberg recounted that "Her Malibu neighbors became the Malibu Archaeological Society and received written permission from the property owners to continue the dig...revealing 14 burials. Word spread of the Trancas dig and John Beaton and Nelson Leonard of UCLA and the Archaeological Survey got themselves into the act." According to Stotsenberg, the initial skull was cremated by the coroner's office because "the bones were not of interest." Stotsenberg reported seeing a portion of the Trancas site remains "in a drawer in the UCLA archaeology department" in 1981. "Nothing was ever done with those bones," she wrote. The site, located under what is now the Trancas shopping center parking lot and the county's flood control channel, contained more than 100 burials dating to approximately 310-430 BC, according to radiocarbon data. Records indicate that the eastern portion of the cemetery was damaged when Trancas Creek was channelized by the Los Angeles County Flood Control District during the construction of the Malibu West subdivision. A portion of the site was also reportedly graded and covered in 50 cm of fill during the construction of the original shopping center parking lot. Rodent activity, erosion and vandalism have also impacted the site. A survey conducted during the recent shopping center redevelopment reportedly found no evidence of artifacts. A sobering reminder of how easily the past can be swept away. And think how ancient that past is. 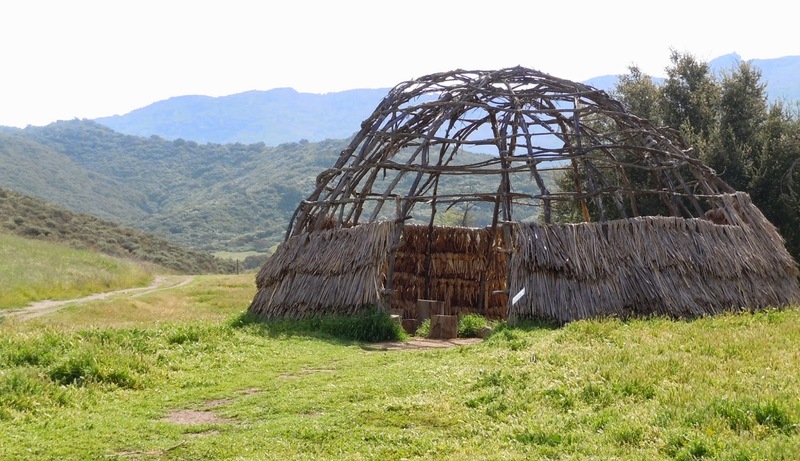 According to radiocarbon dating, the first Chumash ancestors arrived in Malibu more than 10,000 years ago. That's 5000 years before Stonehenge was built. Europe was just thawing out of the last ice age and agriculture was being developed in the Middle East when the first Malibu residents arrived. 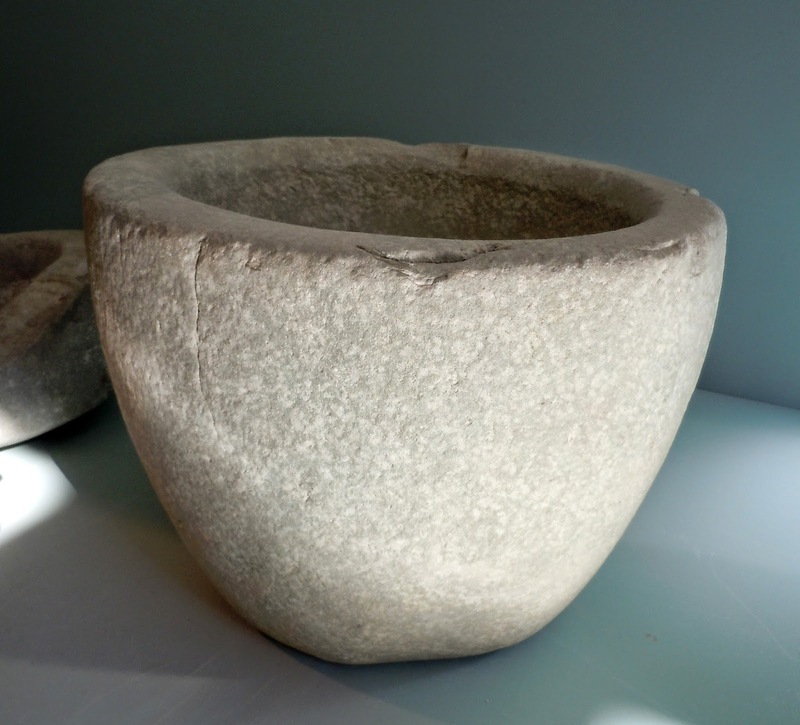 A massive stone bowl on display at the Oakbrook Park Chumash Museum in Thousand Oaks shows the Chumash people's skill at working stone. According to archaeologist Patricia Martz's 1984 dissertation Social Dimensions of Chumash Burials in the Santa Monica Mountains, the excavators at Trancas positively identified 62 adults, six adolescents, 15 children and nine infants. There were 18 burials that appeared to mark “individuals of special status.” One status burial contained the remains of a child of seven or eight. He was the only individual discovered at the site who was buried with beads. 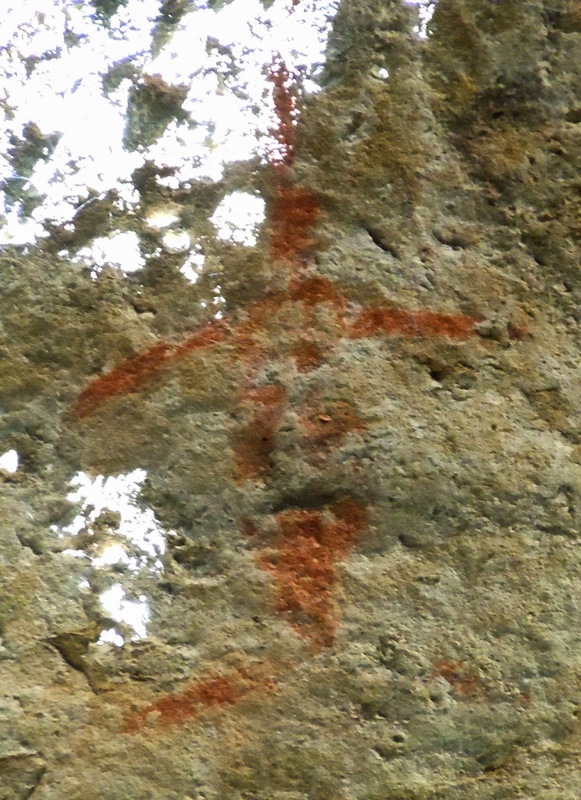 He was also placed in his grave with abalone shells over his body and ceremonial red ochre paint. Martz notes that the excavators failed to record data on the depth of the graves, information on field methodology is missing from the report, and "as might be expected, there is some inconsistent recording and some missing data." The two cemeteries associated with Humaliwo cover a 2500-year period of Malibu history. Excavations conducted by UCLA field students in 1970-71 revealed a site dating to the Chumash Middle Period—800-1000 B.C., with more than 90 graves, and a Mission-era cemetery dating to AD 1775-1805 that held an estimated 140 individuals and approximately 58,000 artifacts, including a sword of Spanish steel and a tiny silver Saint Francis medal, recovered from the grave of a child. In 1995, anthropologists Lynn Gamble and Philip Walker and archaeologist Glenn Russell contracted with the California Department of Parks and Recreation "to organize, document, and complete research reports on the 1970s excavations in Malibu," the sites that had been excavated by UCLA students. According to a 2002 article in American Antiquity, "The collections and associated documentation were in a state of disarray. Hundreds of hours were spent on organizing and analyzing the Malibu material, including the artifacts, skeletal remains, and documentation." 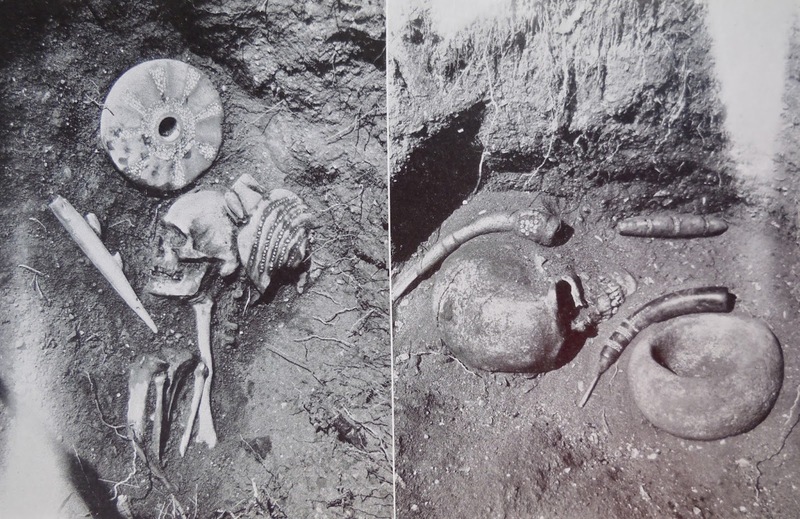 Chumash and pre-Chumash burials continue to be unearthed in Malibu. In the 1970s, a significant Chumash burial site was bulldozed to make way for the Point Dume Mobile Home Park, without the benefit of excavation or reburial. My mother recalls seeing slides of the destruction. "It was terrible," she says. In 1998, the Los Angeles County Board of Supervisors agreed to pay $315,000 to settle a breach of contract lawsuit brought by a construction company against Waterworks District No. 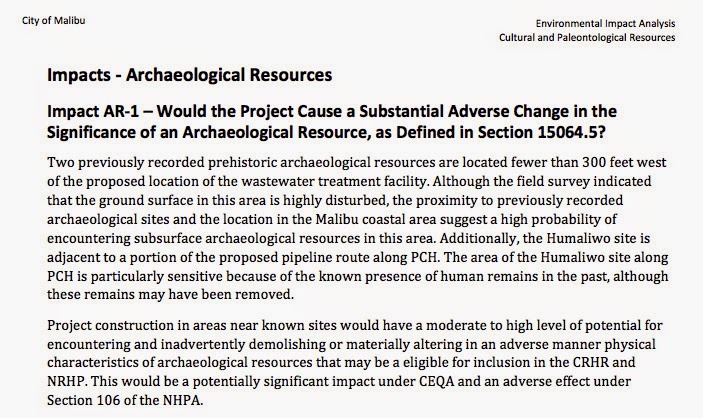 29 after the county discovered the project area included archaeologically sensitive Chumash burial grounds on Point Dume. The construction firm argued that the county's bid package and project specifications were inadequate because of the sensitive archaeological site. A Chumash skull was dug up at a construction project in the Paradise Cove area in 2007. Construction was halted and the authorities notified. 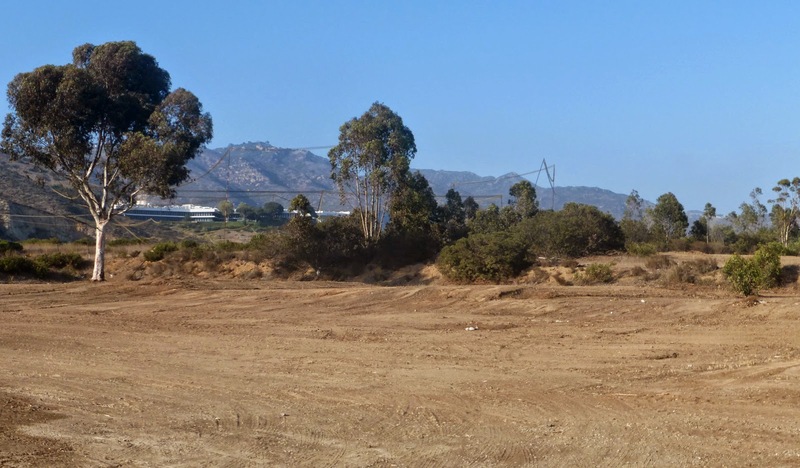 Larry Myers, the executive secretary of the Native American Heritage Commission, said that a member of the Chumash people, having been declared the most likely descendent, had been selected to work with the property owner. Three men were arrested in Point Mugu State Park in 2010 on suspicion of illegally removing artifacts from a burial. But Caltrans construction crews, following the 2013 Springs Fire, appear to have had carte blanche to bulldoze Chumash middens located along PCH in the same area. 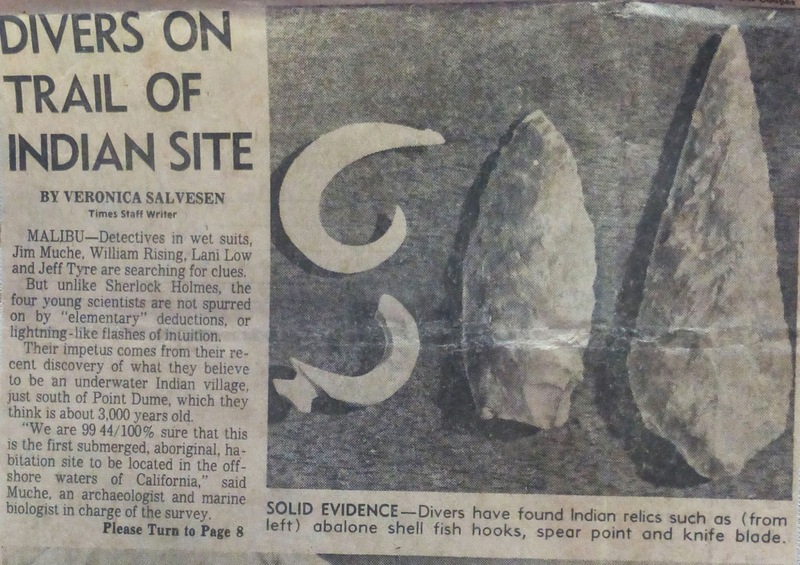 My mom carefully saved this October 17, 1977 article for the Westside section of the Los Angeles Times about a 3000-year-old submerged Chumash site near Point Dume. It is illegal to remove items from a Native American historic site. That doesn’t stop people from picking up bits of the past and carting them home. Astonishing Chumash artifacts are occasionally found at Malibu garage sales. Other collections probably end up in the landfill when the owner moves or dies. There's no way of estimating how many sites have been destroyed during construction projects. 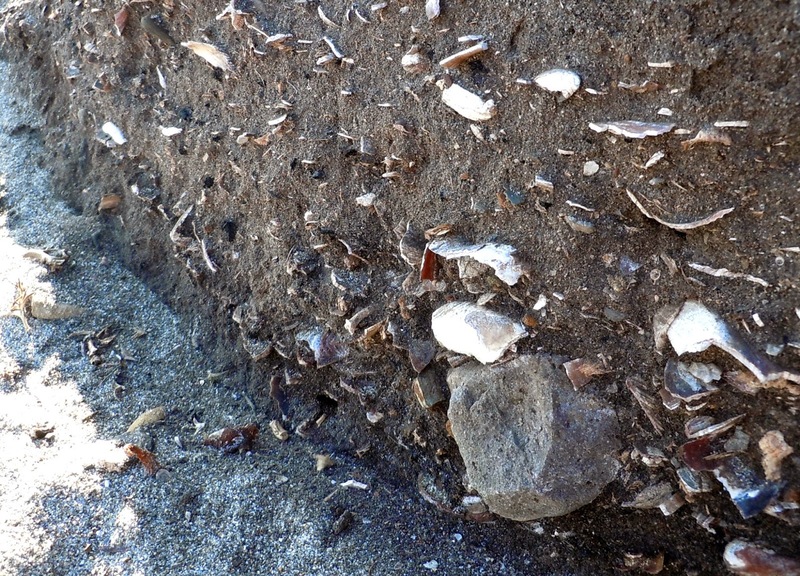 Until the 1970s there were no real protections, and even with increased awareness and federal and local laws, including provisions in Malibu's Local Coastal Program, sites get bulldozed because no one notices the bits of shell and stone until it’s too late. However, disturbing a burial site, no matter where it’s located, is a felony. Burial sites located on private property can be legally covered over, but only after the find has been reported and the closest living tribal representatives have been contacted. 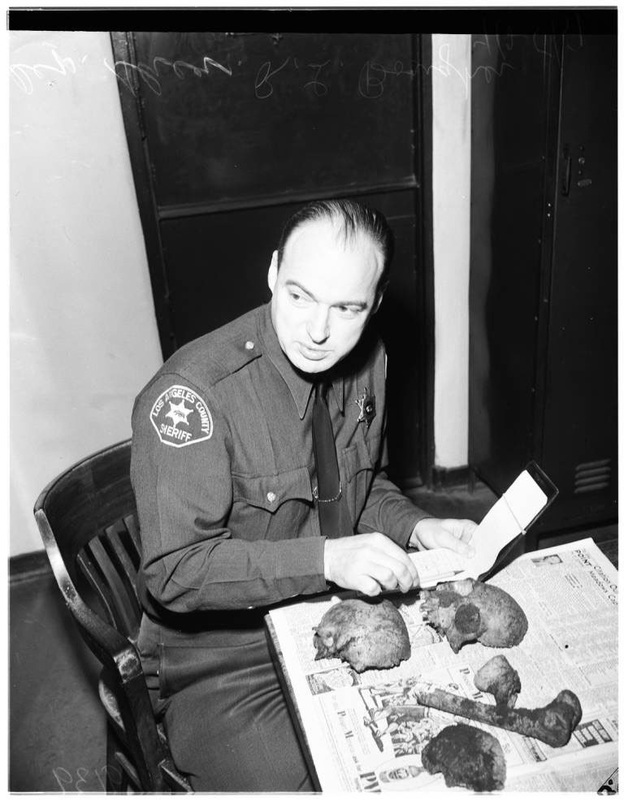 A Malibu Sheriff's Deputy poses Hamlet-like with a pile of prehistoric bones in this 1951 Los Angeles Examiner photo from the USC Digital Library. State and federal law requires that the finder of human remains immediately contact law enforcement. In Malibu cases, the sheriff's department will contact the coroner. Once the remains are determined to belong to a Native American burial, tribal representatives are contacted and reburial, often in situ, is arranged. Property owners may opt to have finds excavated by an archaeologist before reburial takes place, but Native American Civil Rights advocacy groups stress that all human remains should be treated with respect and not regarded as curiosities, collectables or trash. Some would argue that it’s already too late, that most of the damage to Malibu’s cultural heritage took place decades ago. I don’t agree. 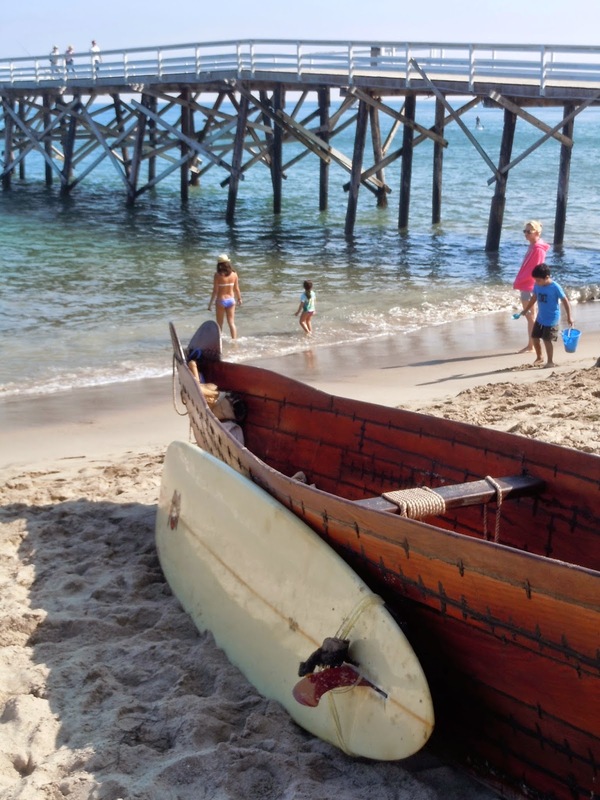 There’s still time to cultivate awareness and to remember and preserve Malibu’s ancient heritage. There’s still a place in the future of Malibu for its past. When I was a child we were taught right here in Malibu public schools that the Chumash were a "primitive" people with little culture and none of the "hallmarks of civilization," and that the entire culture and people were extinct. That antiquated perspective has changed. There's extensive archaeological documentation that this "primitive" culture developed a sophisticated knowledge of astronomy, navigation, boat-building, woodworking, and a trade network that extended across the continent. They must have also had great skills of diplomacy, because they were a mostly peaceful people who coexisted with their neighbors for hundreds, and maybe thousands, of years. There's also been a renaissance of contemporary Chumash culture, beginning during the Civil Rights movement of the 1960s. The descendants of the Chumash are stepping forward to reclaim their culture. Chumash is a language group, not an ethnic designation. The fact that the Chumash language tradition lapsed is probably one of the reasons the extinction myth is so prevalent. But just because the language is gone, doesn't mean the people who spoke it have vanished. Only the Santa Ynez Band of Chumash Indians have so far received federal recognition, but it's estimated that there are at least 5000 Californians who claim Chumash heritage, and an effort is underway to revive the Chumash languages. "When the last Chumash Indian left Malibu, he left a curse," commercial real estate developer Roy Crummer quipped to the Los Angeles Times in 1990. 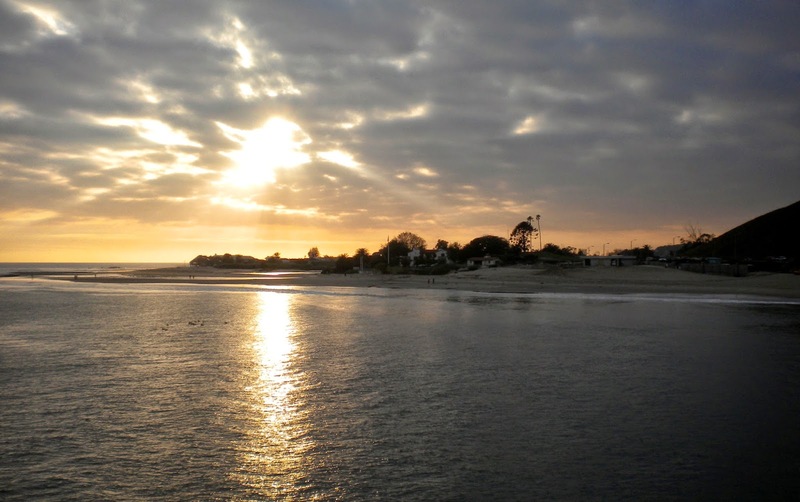 "Malibu is filled with lots of people who are committed and a lot of others who ought to be." Crummer sold his company when it appeared that cityhood was inevitable and the climate for development became less favorable. The Chumash, on the other hand, are still here. Their culture isn’t dead, it’s rising again from the ashes.